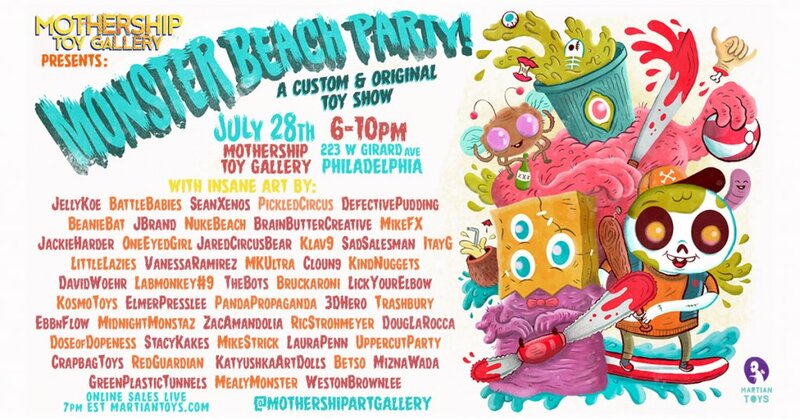 Mothership Toy Gallery hit us up with deets on their new group show “Monster Beach Party” that opens next week! Here’s what they had to say about the show. “It’s SUMMERTIME and not just Bikini Bros wanna get a taste of the sun! Out from every tomb, coffin, and haunted condo, the Monsters are stalking their way to the Beach! Mothership Toy Gallery Presents MonsterBeachParty! Insane Original & CustomToys from the scene. Get yer sunblock, floaties, and band-aids cause this is gonna get WEIRD! FREE and OPEN to the public with plenty of the artists in attendance, you ain’t seen a list like this! In the classic Surf movie, B-Movie style Mothership Toy Gallery are stoked to be putting together a super fun show! Monster Beach Party is exactly what it sounds like and we are hoping for some ridiculous pieces of the opposite of what you may find at the beach this summer. Focus on story and fresh designs, this show is open to Original Sculpts, Short Run Releases, Bootlegs, And Customs on whatever platform you want.” Leave you guys with a little tease of what to expect at the Monster Beach Party! Big props to JellyKoe for the badass Poster!